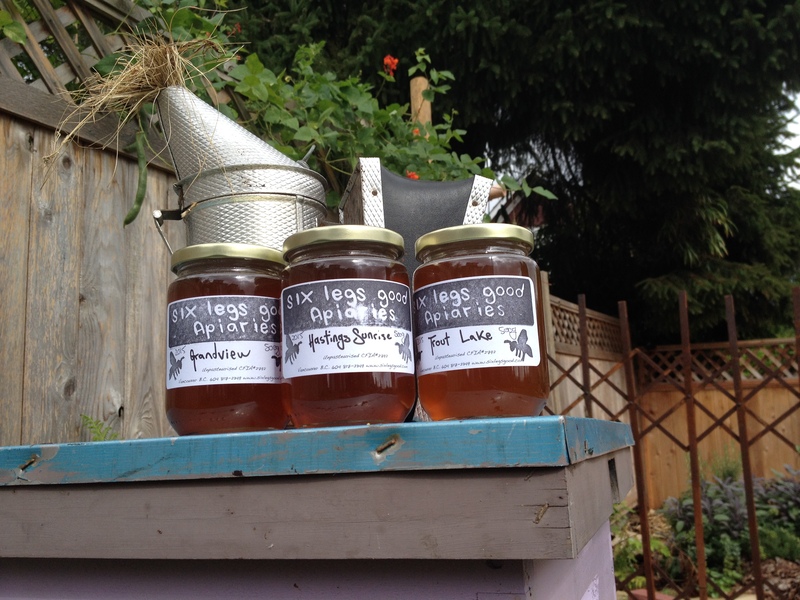 Our fresh crop of honey is ready! If you are already part of the honey hotline (our email list, which we use to send out max. 2 emails per year), you will shortly receive detailed information on where and when (our house, this week). If you don’t want to sign up, check out the contact us tab, and shoot us an email; we’ll arrange for you to drop by. Back by popular demand is Bulk Honey Week, whereby we have honey in a tank at home for a short period of time, and are able to fill your vessels! Bulk honey is priced at $15/kg. Please note, you only need to bring your own jar if you wish to take advantage of the special bulk pricing. We also have lots of pre-bottled honey. 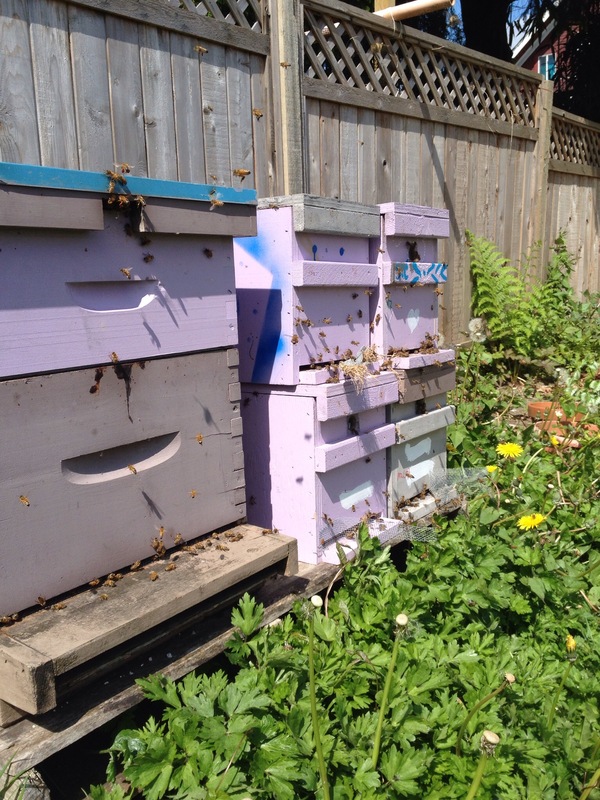 This year, we have 4 kinds on offer, based on where the hives were located: Hastings-Sunrise, Grandview, Trout Lake, and Mostly Blackberry (from our hives out in Surrey). I think the honey in the bulk tank right now is Hastings-Sunrise. This entry was posted in Uncategorized and tagged honey on August 21, 2015 by propolismusic. 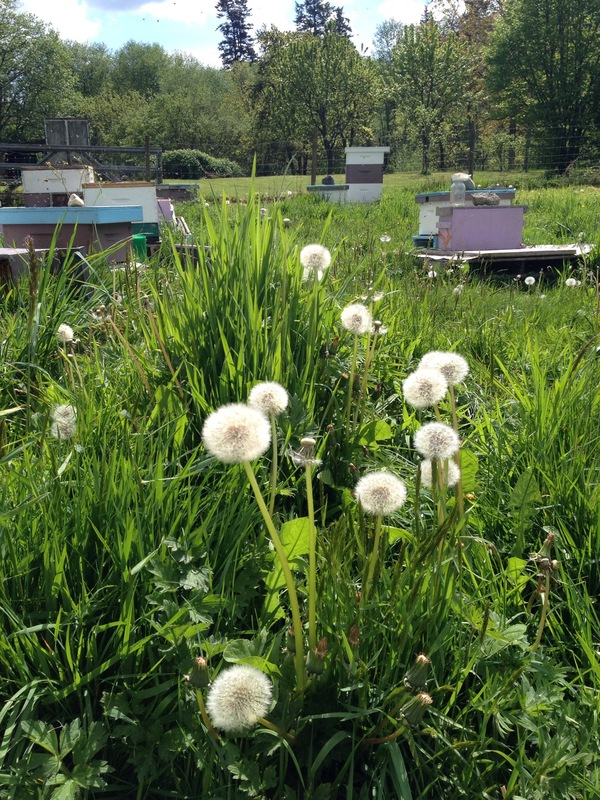 So, between May (our last post) and now, basically all the beekeeping happened. Undocumented, of course! That’s not to say that I didn’t take pictures; lots and lots of bee pics were taken, with lofty intentions for pithy posts. There was the time we took our dear friend with us on a hot July day of backyard hive checks: Don’t worry: only 1 sting, and it was a bee that got squished against a calf! 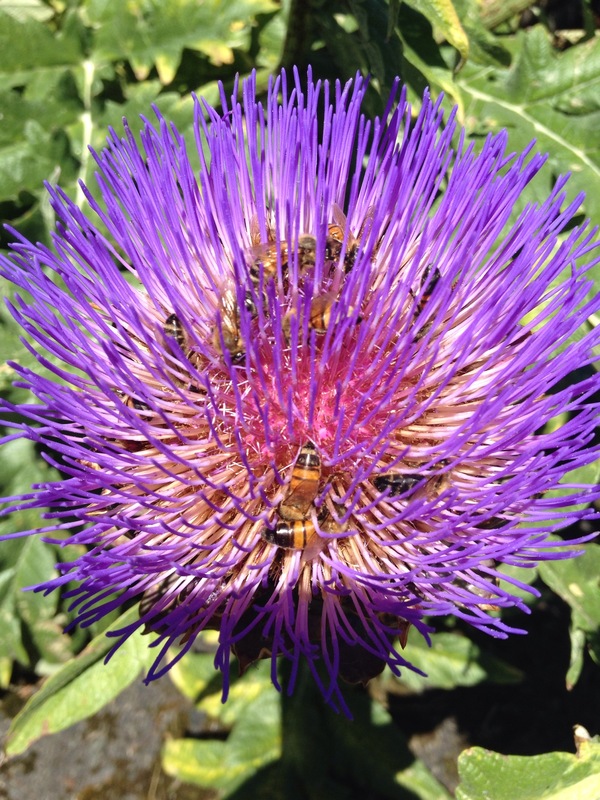 There was all the zillions of enraptured photos I took of bees on other peoples artichoke plants. Did you know that the flower is what happens after the part we eat goes to seed? It’s hard to see here, but I counted 11 bees on one flower! One day I will succeed in growing a plant, seed to flower (you have to start the seeds in February in order to get flowers that year. I’ve grown a plant, but too late in the year, and then we move, during which the plant died. Which was a major bummer cuz I don’t even like eating artichokes. I just wanted the flowers). There was that time during the recent, severe nectar dearth (due to drought in our region), that we had that crazy incident with robbing bees and our sticky truck. 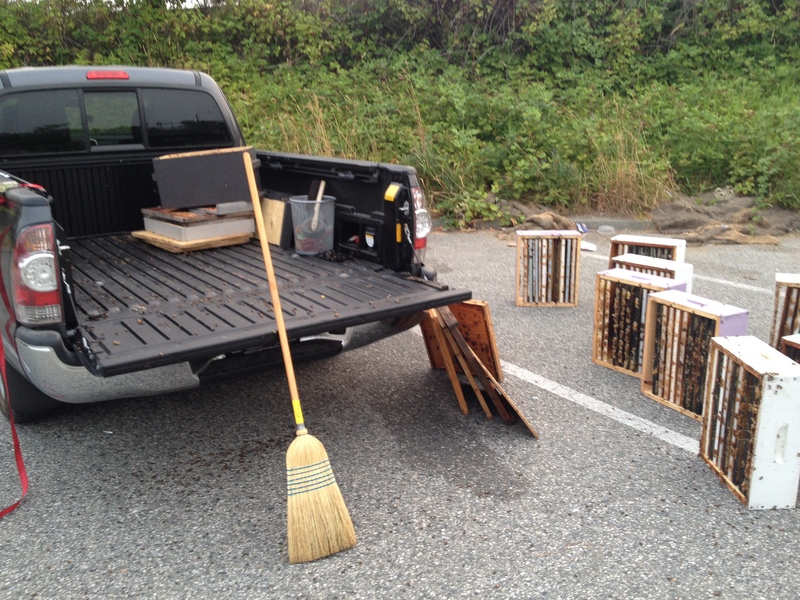 I won’t get into the details, but it involved our truck being in the vicinity of hundreds of marshalled hives (not ours, ready for moving), and our truck collecting so many bees that passersby were visibly dismayed. Robbing bees= bees are really great at finding honey, especially when all the nectar has dried up. They are also fantastic at communicating. So a foraging bee finds this amazing, truck shaped nectar source, goes back to the hive, and recruits, like, 100 other bees to go collect it before it’s gone! Multiply this by as many hives are in the area, and you get robbing. Bees can get pretty crazy when there is no nectar flow, and will completely raid whatever is in that spot they communicated about until it is gone, even other beehives. 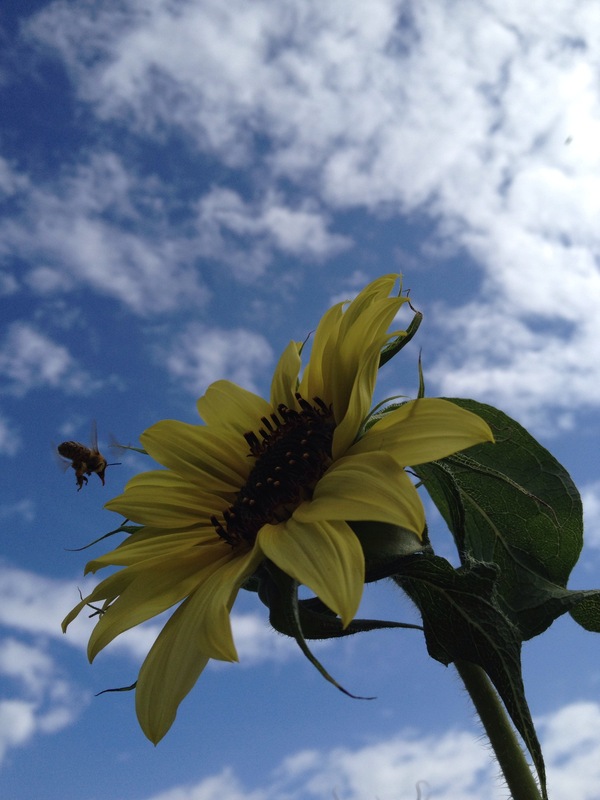 But that incident aside, this summer has been a good one for our bees. 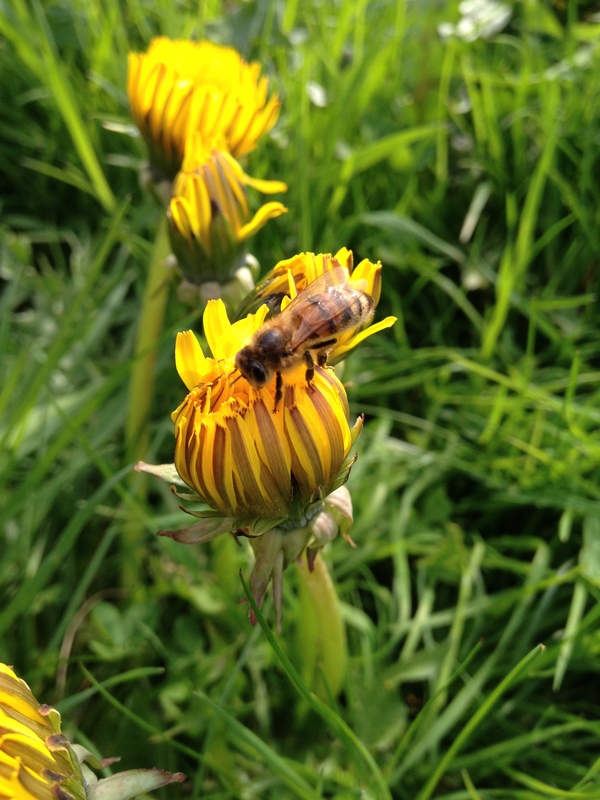 Lots of great mating weather for our queens has made it a laid-back year for queen-rearing. Also, it’s exciting to be able to transport our bees using a truck rather than a hatchback, where you have the fun and enjoyment of all the bees inside the cabin with you! Yes, while our hatchback was a loyal steed, I definitely don’t miss that aspect of it! 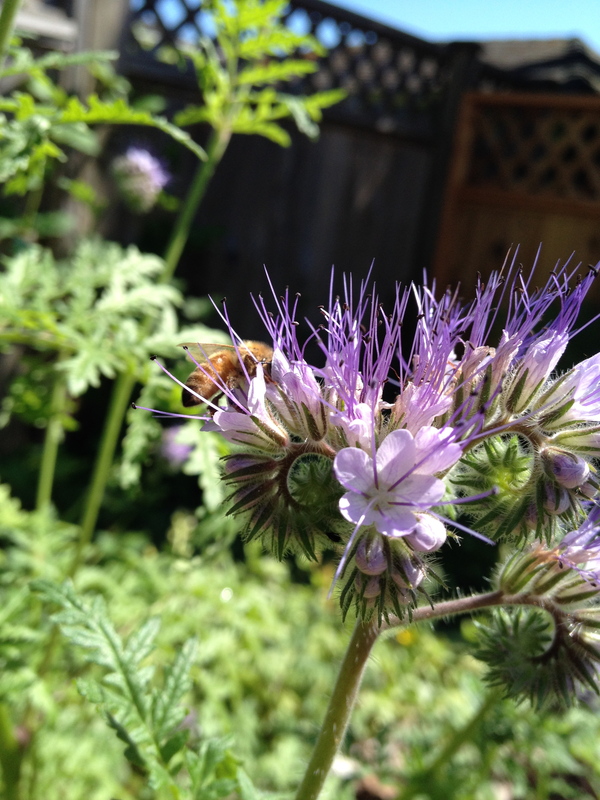 So, I’ll sign off with one of my favorite bee plants, one that is still blooming right now: Phacelia. I love how it kind of looks like a sea creature, with curls and tendrils. 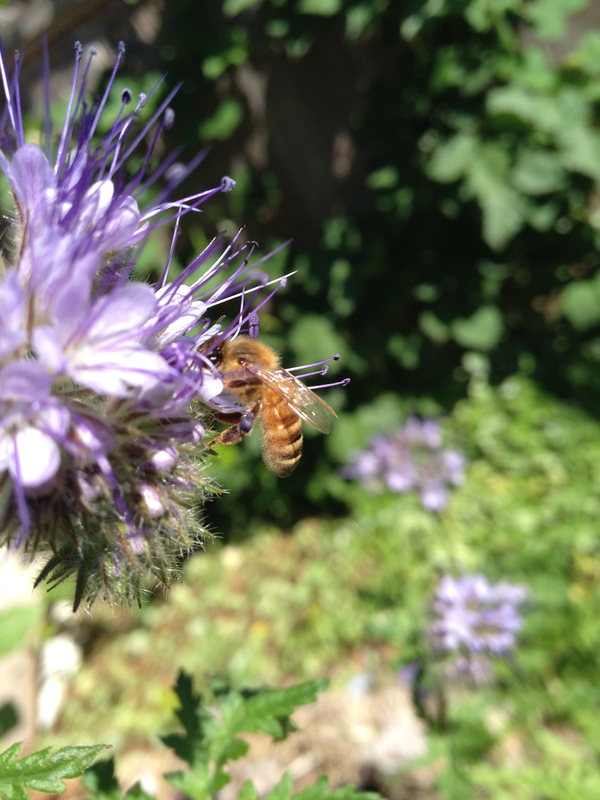 It’s incredibly easy to grow, and bees love it! 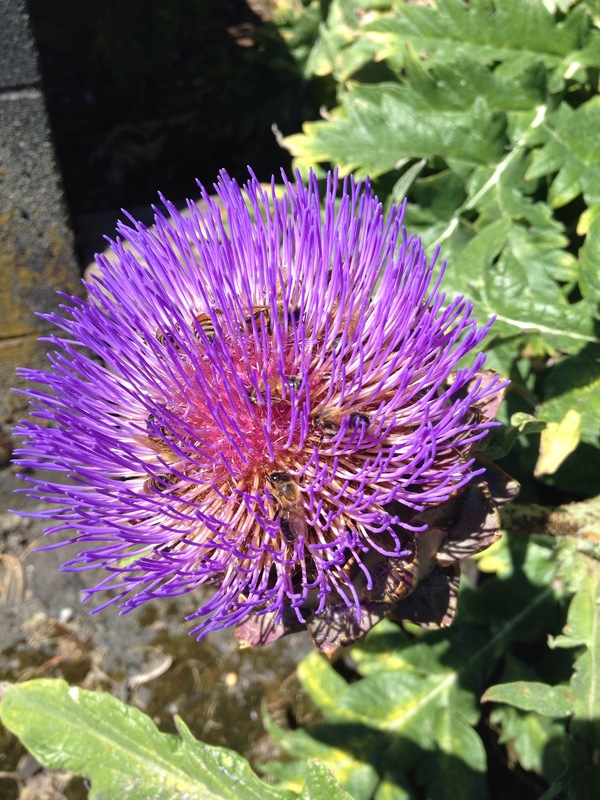 This entry was posted in bee talk, What's blooming on August 7, 2015 by propolismusic. During the winter (beekeeper’s vacation time: I think if you keep bees long enough, you are forced into enjoying winter sports), I was reading Bees: Their Vision, Chemical Senses and Language by Karl Von Frisch. Von Frisch was the scientist who discovered how bees communicate through dancing. He also did work with bees and color, and contributed to what is known about what colours bees can perceive. It’s interesting to think about what colours bees can see, and how that relates to their favorite flowers; Von Frisch says that bees can see yellow, blue-green, blue, and ultraviolet. 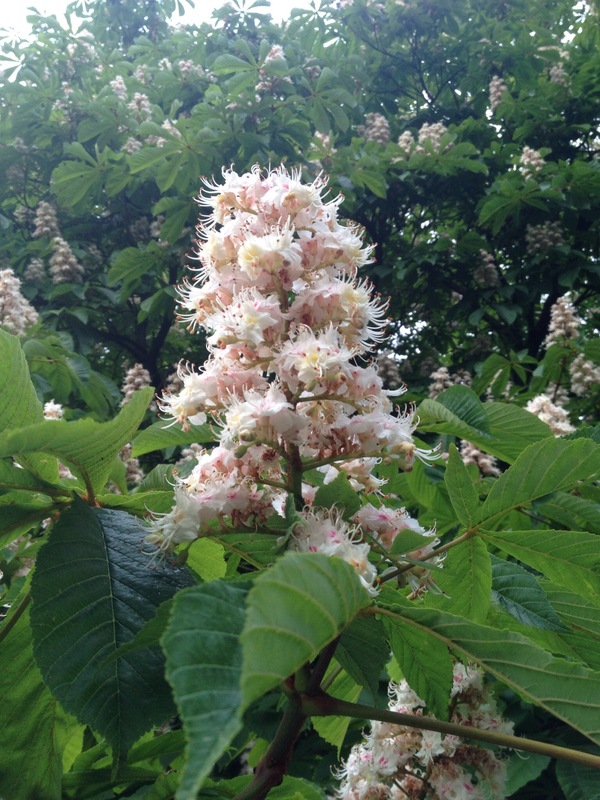 But, there are many great nectar sources that have white flowers (blackberry, horse chesnut, apple etc.). Previously (until five minutes ago, when I cracked the book again), I thought this meant that bees can see white excellently, too. But actually, as Von Frisch points out, “white” coloured light contains all the colours in the spectrum visible to us, because you can split it through a prism into ROY G. BIV. For bees, “white”, then, would be composed of all the colours they can see, (YGBU!). If one component, ultraviolet (which humans cannot see) is taken away, what is leftover would no longer appear white to a bee, and would be a complementary colour to ultraviolet, maybe blue-green, Von Frisch suggest. And it turns out, most white flowers in fact absorb ultraviolet light. So! All along, I’ve been painting some of my bee boxes white because I think they will be able to see it well, and it turns out that maybe yes, that particular white paint may absorb ultraviolet rays, leaving behind the complementary colour to ultraviolet, which bees can see great. But also, maybe the white paint I select may instead reflect ultraviolet, making it a true “white” to the bee, and therefore uninteresting and not memorable (as discovered by Dr. Mathilde Hertz). Unfortunately, I can’t see ultraviolet, so there is sadly no way for me to tell the difference when I’m buying my paint from the hardware store! All this is to say, before I got sidetracked, is that bees cannot see red. They only perceive it as black. 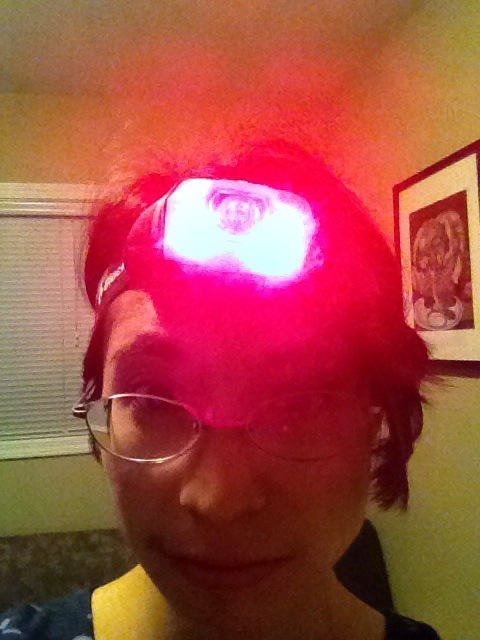 So today, when I wanted to open my queen box to check on the queens, and I knew there would be stray loose bees inside, I took it into the bathroom, turned off the lights, and used Liam’s headlamp on the red-light setting (because it is frowned on in our household to release bees inside. It is also apparently not done to set down nucs right next to the front door, no matter how short a time one plans to leave there). So cool! Bees don’t fly if it’s dark, and it’s the neatest thing to be looking at bees in the red light, and them not being able to see, so they don’t fly up at you. 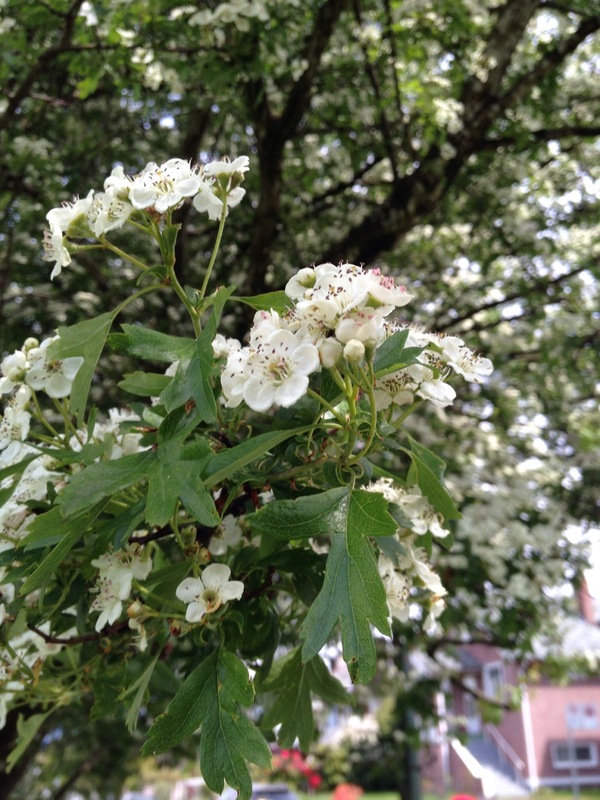 This entry was posted in bee talk, Queens, What's blooming on May 12, 2015 by propolismusic. I took a mushroom course once, and the instructor told us that he likes to think of mushrooms as friends: Every year you acquire a few more, and you always recognize your old friends. You don’t have to know every mushroom to safely eat them, but you can always add new friends. 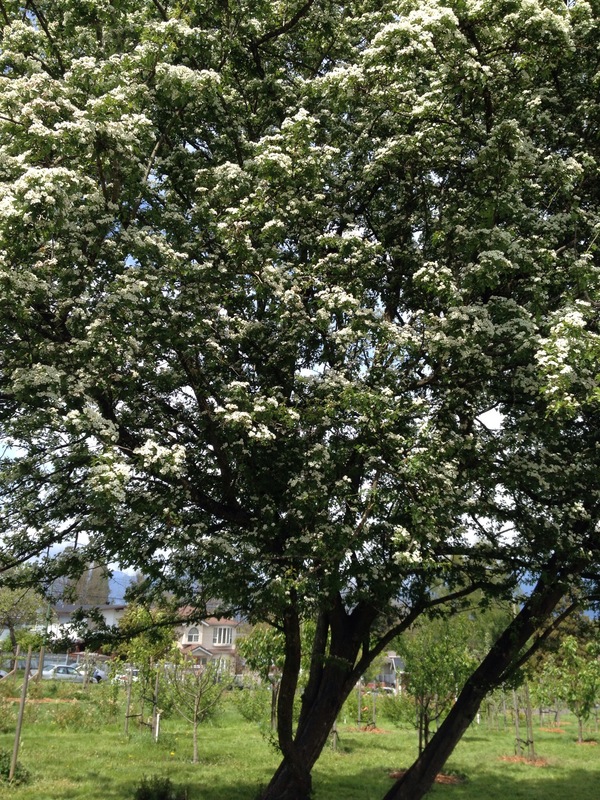 Very beautiful, and loaded with blossoms. My (or someone else’s ) bees were foraging on it , but I couldn’t get a close enough look to see if they were getting pollen or nectar specifically. 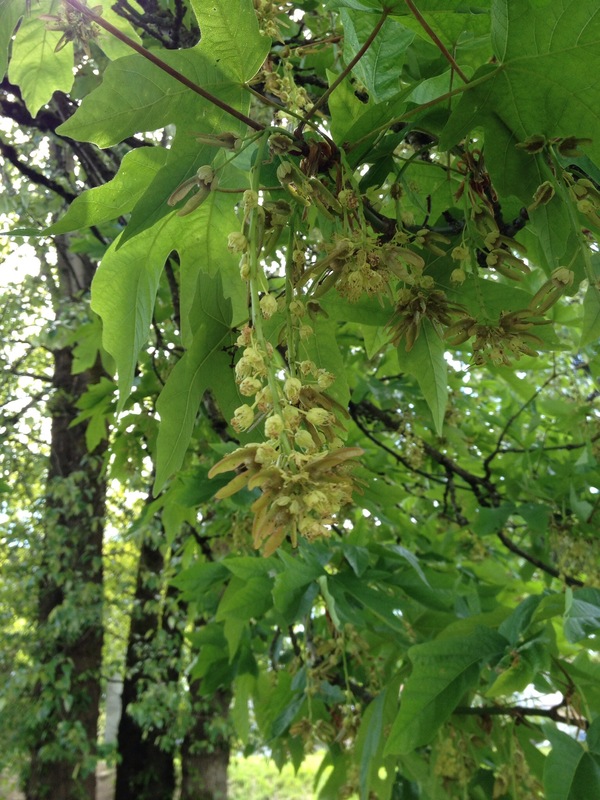 Many people are surprised to hear that Maple is a major nectar source, because the flowers are kind of pale green so they aren’t that noticeable, but maple trees get huge, and have tons of blossoms per tree. 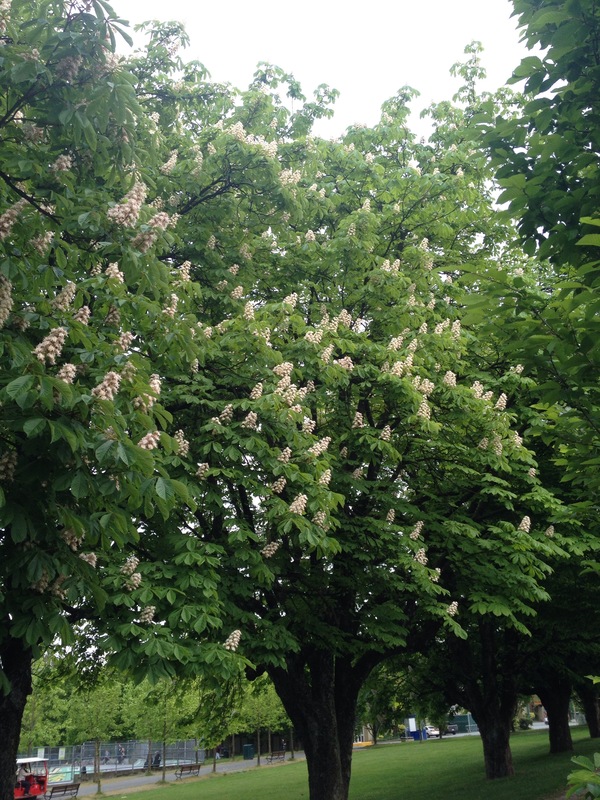 This entry was posted in What's blooming on May 8, 2015 by propolismusic. The novelty of successfully plunking your giant clump of bees into a bucket wears off exceptionally fast, especially when ladders are involved! 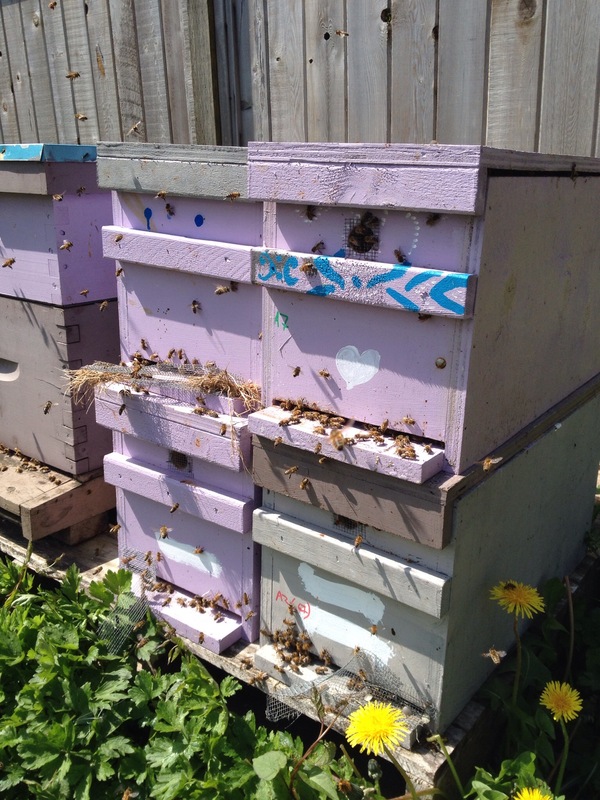 Anyway, we’ve been trying to keep ahead of the swarming impulses this year by systematically removing excess brood frames with bees on them, and making them into nucs, mini colonies. Our first round of queens is not quite ready yet, but we make these nucs up queenless, and then take them out to our mating yard in Surrey. 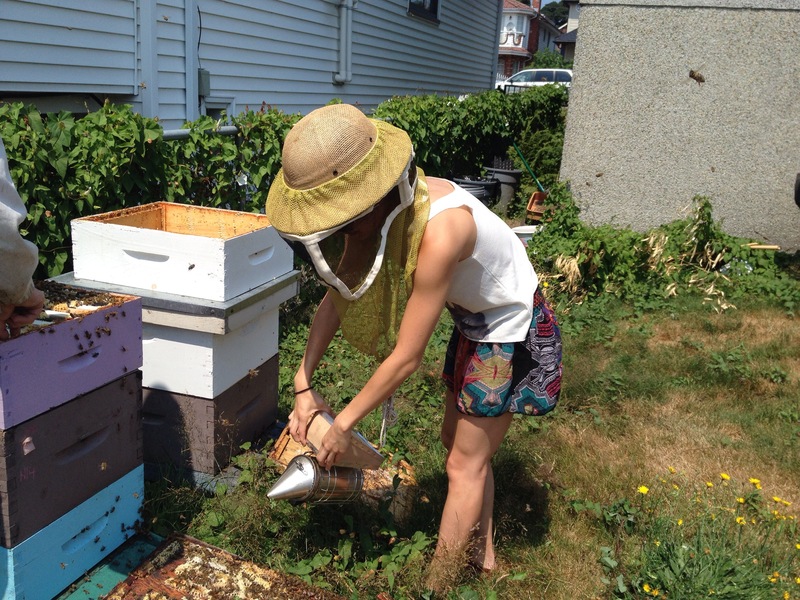 The bees make their own queen, and she is able to successfully mate in an area with sufficient drones, in a way that doesn’t really happen in Vancouver proper. That’s our regular size backyard hive on the left, with 4 nucs stacked apartment style on the right. 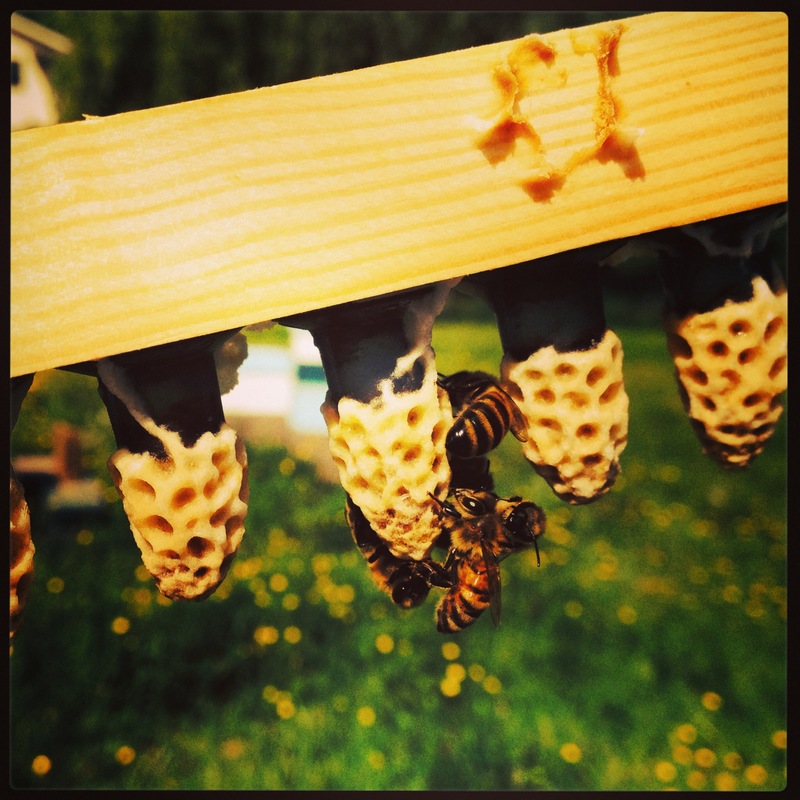 This entry was posted in bee talk, nucs, Queens, Swarm management on May 2, 2015 by propolismusic.